"It sort of, crept up on me," Alexa Chung told Who What Wear Australia about her career. Recently in Sydney to celebrate her latest collaboration with Superga, we sat down with the model turned businesswoman to understand more about her career evolution, and the success of running her own business. It was modelling that kick-started Chung's career as we know it today. Her desire to shift into the world of design grew organically from spending time on different photo shoots, and working with a handful of brands on multiple collaborations. "It was kind of an idea that I had as a teenager, but didn't think [much of it], then I started modelling,” she says, when pressed on whether being a designer was always the goal, and now, it's one of her proudest moments, explaining "being able to coral enough people into believing that I knew what I was doing, has been a great achievement". Chung's modelling foray eventually lead to a stint presenting for MTV. "It got to a point where I hadn't gone to university, and I felt like there would be a shelf life for modelling… getting to have a voice on the camera, was a good moment," said the creative. From there her career continued to skyrocket, With collaboration after collaboration under her belt, Chung decided to take the risk and finally pursue the dream of her own fashion label. "I think for me, the challenges I faced are probably different from other people starting a fashion line because I had the advantage of already being known in a fashion realm." She continued, "It was a disadvantage when it came to starting from the place of clarity, because I think one thing we've been up against is people's preconceptions about me as a person interfering with how they view the clothes, and whether they are able to be subjective or not about that." But Alexa's business knowledge is bang-on. Explaining "if you make a good product, you make a good product, and it's either got desirability attached to it, or it hasn't. So we have to, we work very hard to make things". No one could say Alexa isn't a hard worker. The designer is in the office each day, navigating the ins-and-outs of running her own team. We couldn't spend time with Alexa and not ask her specifically about some fashion trends. So what does she think we should be tapping into this summer? Bike shorts (of course), and recommends wearing them under a see-through shirt, paired with a chic sneaker. With Alexa's seal of approval, we'll be ticking off three of this year's biggest trends—bike shorts, chunky sneakers, and sheer shirts. 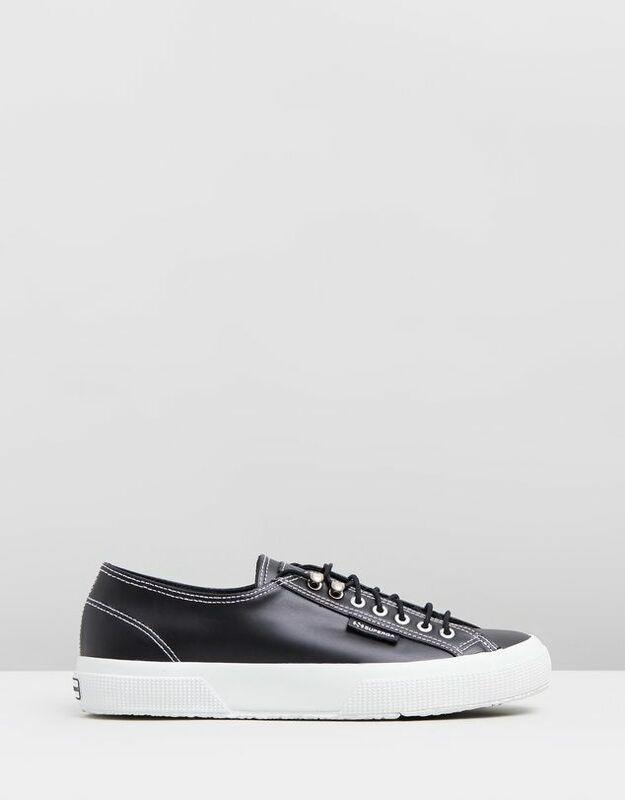 Shop Alexa Chung's collaboration with Superga.